Goodreads: A desperate phone call embroils Lou in scandal and murder involving Dr. Gary McHugh, known around the Capital as the “society doc.” Lou has been supervising McHugh, formerly a black-out drinker, through his work with the Physician Wellness Office. McHugh has been very cavalier about his recovery, barely attending AA and refusing a sponsor. But Lou sees progress, and the two men are becoming friends. Now, McHugh has been found unconscious in his wrecked car after visiting a patient of his, the powerful Congressman Elias Colston, Chairman of the House Armed Services Committee. Soon after McHugh awakens in the hospital ER, Colston's wife returns home to find her husband shot dead in their garage. She then admits to the police that she had just broken off a long-standing affair with McHugh. Kritters Thoughts: Have you ever wanted an inside look at the unspoken missions of the marines? Do you wonder how many people are involved when decisions are made in the military? This political thriller not only takes you behind the scenes, but the reader feels a part of the investigation as the clues are unraveled at just the right pace. From the first pages, the reader learns that a Congressman has been shot in their home and all fingers are pointing at the likely culprit, but one doctor is trying to trust their instinct and find the real killer. The book was fast paced, but didn't break my neck. Although I am not a military person or married to one, I still felt like I knew exactly what the author was talking about, it didn't go over my head - I loved it! There are twists and turns up until the last page, but nothing is thrown out of left field where it doesn't complete the whole story. I loved how the culprit was revealed and the motive behind it - can't spoil this one!! This political thriller is definitely one to pick up and read, but beware you may not be able to put it down until the very end. Disclosure of Material Connection: I received one copy of this book free of charge from Scratch MM. I was not required to write a positive review in exchange for receipt of the book; rather, the opinions expressed in this review are my own. 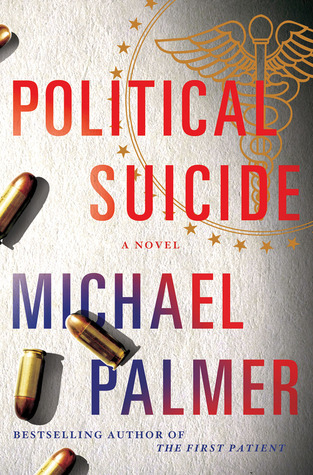 I've never read any Michael Palmer but I hear he's good. I'll put him on the list!